You may need a Kitty Translator to decipher a paw tap. When you're sitting around relaxing with your precious kitty, not many things can be more endearing than her placing her tiny paw into your hand. Sometimes though, the intention behind the action may not be crystal clear. Pawing can signify anything from the desire for attention to pure joy. When your cat puts her paw into your hand in a rather abrupt and fast manner, she may be trying to get your attention for whatever reason. Maybe you're staring off into space looking out the window and she wants you to rub the sides of her face a little more. She may even want a few more of those yummy turkey-flavored treats you gave her the night before. This kitty just doesn't want to be ignored. If Fluffy kneads your hand using her paw, take it as a massive and genuine compliment. This action may look like your pet is mixing dough, hence the name. Kneading is kind of a throwback to a cat's soothing kitten days with mommy during nursing, so if your cutie is doing it in your hand, then it's a surefire sign that she feels relaxed and comfortable while in your presence -- aww. A sweet kitty kiss, indeed. 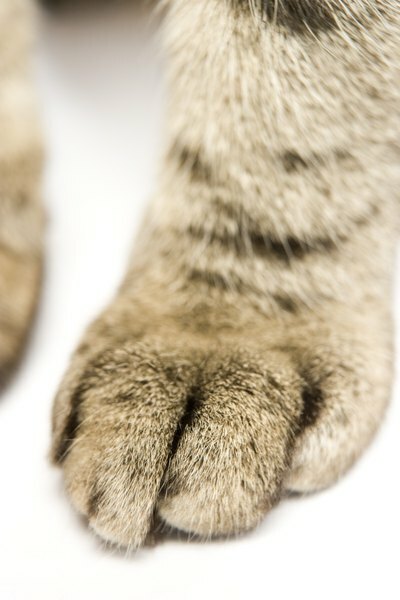 The placement of a paw into your hand also may indicate that your cat is feeling rather impatient at the moment -- and maybe even slightly annoyed. Perhaps you're taking just a little too long to open up her can of tuna and chicken, for example. If she puts her paw into your hand, she may just be telling you in her own cute feline way to hurry! When your fluff ball puts her paw in your hand, she also may be letting you know that she's feeling rather playful. Perhaps she wants you to take out her beloved toy bird so you can throw it around and have her chase after it. Maybe she's eying the trusty feather wand you have stored away in the shelf above the television. This kitty is feeling spirited, lively and energetic -- and wants to have you as her partner in playtime. When Do Cats Grow Out of the Hyper Crazy Stage?